Farsleben train, moment of liberation, Friday the 13th of April,1945. Two American tank commanders in Sherman light tanks and their major in a jeep liberate the train, deep in the heart of Nazi Germany. Stunned survivors come to the realization that they are saved. Major Benjamin snaps the photo. 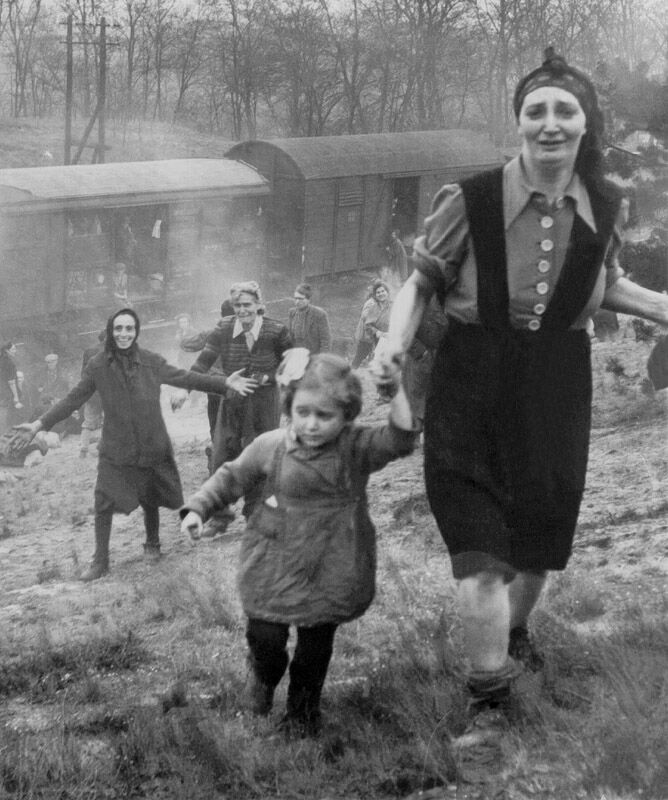 This online journal was begun to chronicle the unfolding of something very special in my career – the re-connection of a train transport full of 2500 victims of the Holocaust with the American soldiers who liberated them on April 13th, 1945 near Magdeburg, Germany. I’m a teacher, teaching history in the small town that raised me. But the things we have done here reverberate across borders and through time. They started out as little things, that all teachers with a spark of passion do. He told me a story. If you keep reading, you will begin to understand why I was driven to bring it back to life. But it did not begin like that. As they say, the truth is stranger than fiction. I have to believe that there are other forces at work, that there is something else larger than me guiding this experience. In teaching history, we made history literally come to life. And in the process, we made history ourselves. On September 25, 2009, ABC World News, featuring a story narrated by Diane Sawyer herself, nailed it down when she named us as their Persons of the Week in a Friday evening broadcast that went out across the nation. Eight million folks tuned in and got to watch as what we did here-students and teachers, soldiers and survivors- in this small town high school. We tripped the wires of the cosmos. And many times I come back to the question- how did it all begin? First-off, the old soldier darn near did not tell me the story. 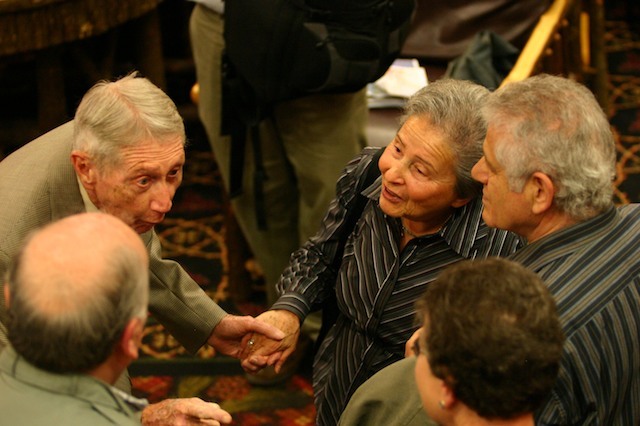 I did my interview with World War II US Army tank commander Carrol Walsh in July 2001. For two hours we talked about battles and close calls, friends he lost and those he bonded with. He hated the war, he hated the Army. “Well, I think you had an obligation and you knew it, and you weren’t going to let the guys down, that’s all.” Walsh mentioned the train, almost as an afterthought, and only when prompted by his daughter. He directed me to his friend on the West coast, George C. Gross, who had a negative of that photo, and ten others of the train liberation that he himself took. With enthusiastic support and heartfelt blessings Dr. Gross gave me his narrative of the liberation , which I posted to my school oral history website in 2002. So, it sat there for four years-on a solid day my original website might have gotten 25 hits. First Reunion, Hudson Falls High School, Fall, 2007. 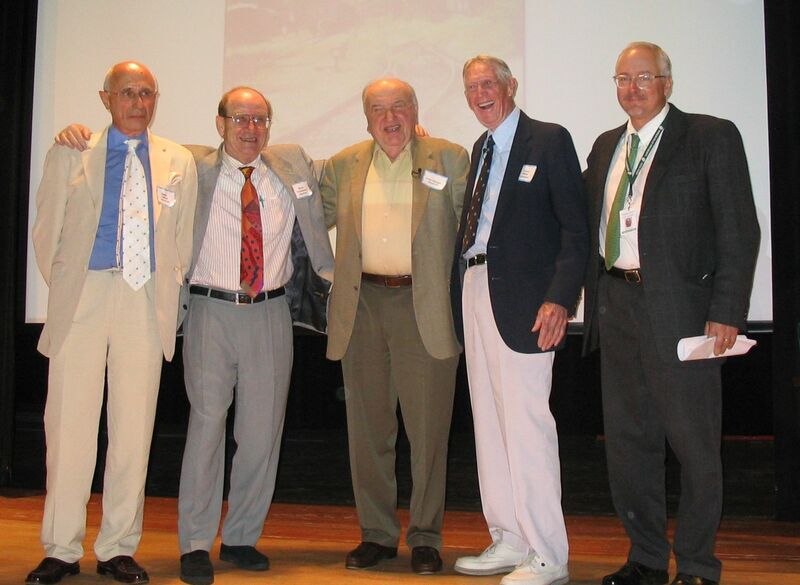 Dr. Peter Lantos, Dr. Micha Tomkiewicz, Fred Spiegel, Carrol “Red” Walsh, Matthew Rozell. Greg McDowell photo. Chris Carola of the Associated Press (AP) picked up the story, and the school website shut down over the weekend because of the volume of hits! Since then we have had over 10 reunions, with three major ones occurring at our high school for the benefit of students. 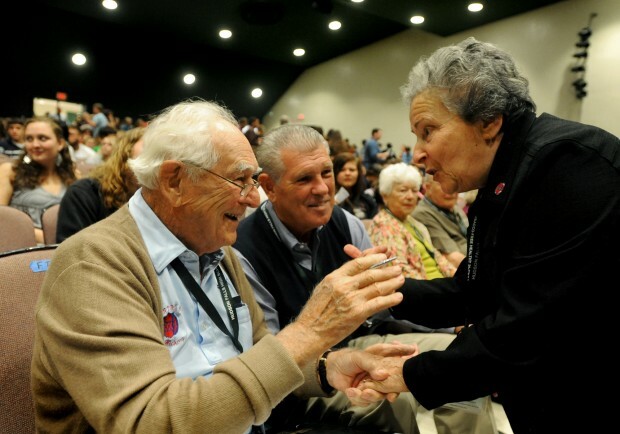 Today, with the help of soldier-liberator Frank Towers and survivor’s daughter Varda Weisskopf of Israel, we have tracked down nearly 275 survivors who have been very moved to discover the soldiers who freed them and who also nursed them back to health. More accurately, though is that many of them have found us. Thanks for stopping by! You can learn more at the “Liberation Photos” page, or move right into the blog itself. If you would like to subscribe for updates, there is a button to the right of this page. 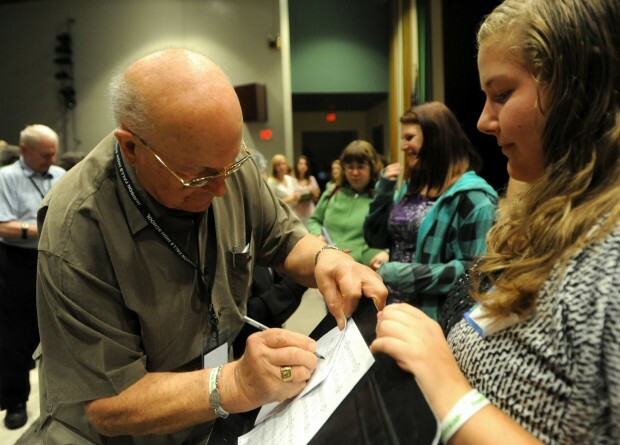 “I am a survivor of a concentration camp. My eyes saw what no person should witness: gas chambers built by learned engineers. Children poisoned by educated physicians. Infants killed by trained nurses. Women and babies shot by high school and college graduates. MATTHEW ROZELL, History Teacher, Hudson Falls High School, New York, USA. State University of New York at Geneseo, Alumni Educator of the Year 2013. A former student of yours posted links to your websites in response to a Holocaust Remembrance Day posting I made on a woodworking forum I frequent. I’ll be returning there to thank him shortly, but stopped off to thank you for the work you and your students are doing. It is important that the individual stories of those who were there be told. Thank you for your efforts in this. As the husband of a High School English Teacher, gotta differ with you about what subject matters the most. Gotta be able to read in order to learn history, but I’ll give History (not social studies) second chair. Over at the woodworking forum we have a saying, “Better to learn from the mistakes of others since we don’t have time to make them all ourselves.” Would that more of those who have the microphones and soapboxes in our world would bother to learn from the mistakes of history, but it seems they are often more intent on rewriting it than in learning from it. Again, thank you for your efforts on this most important subject. One can’t minimize the importance of being able to read and write well. But, what is “English” anyway? The study of language and literature, inexorably linked to the experience of man, which is history. There is no first or second chair. on May 29, 2008 at 3:27 pm | Reply Terri T.
Pete at USHMM asked me to contact you and send you a link to my Quad City liberators’ website which was my project as an MTF. The Quad Cities includes four main cities, two on the Illinois side and two on the Iowa side (Rock Island, IL; Moline, IL; Davenport, IA; Bettendorf, IA). and the surrounding area. I never realized how important history is, and that there is so much around us, that is until this year. My grandmother took care of a ww2 veteran for many years. For as long as could remember, he would tell me stories about fighting during ww2 and the wounds he had gotten. Because I was just a kid, I never realized he had faught in ww2, and now it seems much more important. I guess what I’m trying to say, is that you are an amazing teacher. You make people want to care about History, the good and the bad. In one year you can change lives. Especially with the Holocaust reunion. Keep up the website! I’m no psychic, but I think your grandmother was trying to tell you something. Maybe the “Lucky Penny” will bring you some inspiration and you will figure it out. I’ve been reading your blog for awhile now and I have to say I am very touched with your devout love for humanity. You are one of those special teachers students can never seem to forget, myself included 😉 I hope you will still be teaching at HF when my kids get into 10th grade… 5 more years! That would make me very happy indeed. There are so many beautiful stories posted on this site! Thanks again for sharing them. Good luck. I have many pictures of Strutthof if you wish me to share them with you. first at all I apologize for my incorrect english. I live in Iffeldorf since 2005 and I am doing researches about the train with prisoners from Dachau, which has ended in Staltach. So far I could make interviews with old people from Iffeldorf and also make some researches at the archives of KZ Dachau but it would be extremly helpful to find people who were in the train. Was your request from January successfull in any way? My uncle-by-marriage was in the Warsaw Ghetto in early 1943, and ended up in Bergen-Belsen, possibly via the Hotel Polski fiasco. He survived and emigrated to Israel. He would have been about 45 years old at the end of the war. I don’t know his name – possibly Yosef Berg/Barg. His wife — my father’s sister — Franka/Francezska and daughter died in the ghetto. I am trying some long-shots in case someone might remember him. Start with records at the US Holocaust Memorial Museum (ushmm.org), Yad VaShem (yad vashem) in Israel, and JewishGen.org. In addition, there are staffer at the two museums and at other Jewish historical societies who can help you research these people and events if you hit a brick wall. Humanity has learned nothing from the Holocaust – witness Cambodia, Bosnia, Rwanda and Darfur. Neo-Nazis and skinheads promote the concept that the Holocaust never occurred, or that Jews somehow deserved their fate. They now teach another new generation to deny the Holocaust. As we continue to live in an age of prejudice, genocide and ethnic cleansing, we must repel the broken ethics of our ancestors, or risk a dreadful repeat of past transgressions. A world that continues to allow genocide requires ethical remediation. We must show the world that religious, racial, ethnic and gender persecution is wrong; and that tolerance is our progeny’s only hope. Only through such efforts can we reveal the true horror of genocide and promote the triumphant spirit of humankind. My grandfather’s name (Miklos rosenfeld) was in “1945 Manifest List-Names of those liberated at Farsleben, Germany, April 13th 1945”. i’m from brazil. Where can i get more info? Contact Bernd Horstmann at the Bergen Belsen Memorial in Germany. You may also wish to try the Survivors Registry at the United States Holocaust Memorial Museum. I may have some info of interest to you. Thank you for creating this miracle, Mr. Rozell! …but I did find you! I’m reading the story & comments & found you, a Mogilvesky! Perhaps we are distant mispocha, as my grandpa John was from Mogilev, Russia. I have a wee bit more information when you reply. I do know that my father-in-law’s family had converted from Judaism to Russian Orthodox to save their skin in the distant past. My maiden name is Potter (not Jewish), but my mother’s maiden name is Morgenstern. I am Jewish because my mother is. I’d love to hear about your family! You rock and make the world smile. Thank you!!!!!! Belsen was liberated on April 15th so I think you have the date incorrect. 1945 would also fall 68 yrs ago. If he was liberated on May 13 that is 5 days after the war ended. Hi my name is Sandra from Toronto,ontario. My father -Zelig pilzmacher was from krakow.. death marched to Gross rosen and Dora and finally to Bergen Belsen. He was liberated by the British on May 13, 1945.-70 th anniversay today- I would like to connect with anyone who knew my father from that period.I did speak the curator of the holocaust memorial in Bergen Belsen. But did not find a lot of information. You never cease to impress and amaze me. I am proud of all your efforts and glad to have been along for the ride with you for many years…yeah maybe we did not hang out that much but I am honored to still call you my friend. Great job! Wow! How fortunate for all of your students to have had such a dedicated and wonderful teacher. Their lives have been touched by a great person! And they will always remember what you taught them.